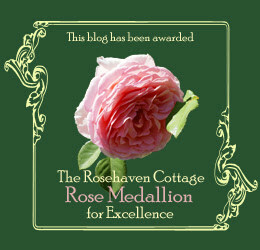 We, at Rosehaven Cottage, are pleased to announce the introduction of a new award exclusively from Rosehaven Cottage--The Rosehaven Cottage "Rose Medallion" for Excellence. The "Rose Medallion" will be given by Rosehaven Cottage to blogs that we find to be of exceptional merit in design and content. The blogs given this honor will be those that we have found particular enjoyment, inspiration, and/or insight(s) in reading--blogs that have exhibited a passion for living. We hope as the "Rose Medallion" is awarded, that the recipients of this honor will be pleased to display it on their blogs. The first recipient to accept this award is Daisy the Curly Cat whose whimsical blog has brought us such enjoyment and laughter we cannot begin to put it into words. Her Sunday Comics are wonderful gems that make us giggle (sometimes full on hysterical laughter like when Daisy drove a car). If you have not discovered Daisy, please visit her blog and enter the world of a wonderful little cat with great fashion sense. The second recipient to accept this award is Holly at 2 Kids and Tired. Holly is a very talented writer that is raising two darling boys in the way that boys should be raised -- with lots of love! She writes about life and her blog is inspirational and thought-provoking. Her occasional blogs entitled "Conversation At Our House" featuring conversational exchanges with her boys always bring a smile to my face. That is a very beautiful award! I got your email and I am very happy and proud to accept this award. You are very nice! Thank you ever so much. Cindy only you could design such a grand and beautiful award. It is so in the spirit of VICTORIA. 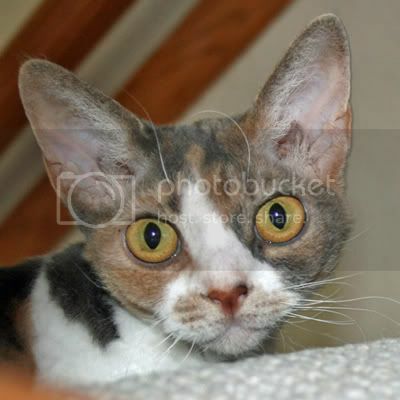 Daisy is a purrrrfect blog kitty and deserves it so. Thank you for your visit and wishing me well. I came for a visit today because I needed a refuge and Rosehaven is the place of choice. It's a beautiful award and I'll be sure to visit Daisy! I am honored. Thank you, my friends, for the kind words! It will be displayed on my blog and appreciated, although not as much as your friendship! What a beautifully designed award. I love the concept. On behalf of our Good Cats, thank you for the attractive honor, Cindy! We'll have it in place very soon. Thank you so much - I'm honored!! I love the design of your award - very pretty. I'm glad that you enjoy my blog because I love coming here and reading your thoughtful posts and beautiful photos. Hugs! !